The satin finish Aluminum Corner Guards are unmatched in beauty. They protect against severe blows. Provides a tough, yet light and attractive metal look for your corner protection. Inexpensively. . Ideal for medium to high-impact areas. Easily painted to match your wall color. For use in restaurant kitchens, hospitals, etc. Easy to sanitize. Install clean corner of wall to remove loose particles and dust. Attach corner guard to wall with screws or adhesive (optional). can the aluminum corner guards be cut to fit different locations with different sizes that don't exactly match the lengths you provide ? For example, if I needed 3 pieces for a little over 9' , could I buy the 10' piece and cut it to 3 pieces ? Could these be used for an outside corner of a shower where tile meets sheetrock? Would they be fine in a humid area like a bathroom? I'm restoring a vintage travel trailer. Can these be used on exterior corners? They must be flexible to place over the "canned ham look"
Is this something that could be put over an exterior door casing on a commercial building? The door frame is taking a beating from wheelchairs as it is made out of wood. 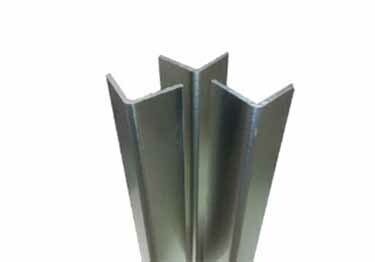 Are these corner guards satin finish or mill finish? We do not want the finish to show fingerprints. Would it be possible to get a sample? The satin finish Aluminum Corner Guards are unmatched in beauty from Koffler Sales. They protect against severe blows and provide a tough, yet light and attractive look for your metal corner protection. These aluminum corner guards look amazing in our newly remodeled new car showroom, and they holdup to heavy traffic and constant cleaning. I ordered the aluminum corner guards with adhesive kit. They were very easy to install and look great. Very high quality product, fast shipping. Were needed some corner protection, found this material on-line, ordered it site unseen and it was everything we had hoped it would be. We ordered the self adhesive type and it sticks just like it should. Satin finished Stainless Steel Metal Corner Guards for walls; unmatched in beauty. Stainless Steel protects against blows.